MiTeC System Information X is a free system information tool for the Windows operating system. It's completely portable, provides in-depth hardware details, and is even free for commercial use. 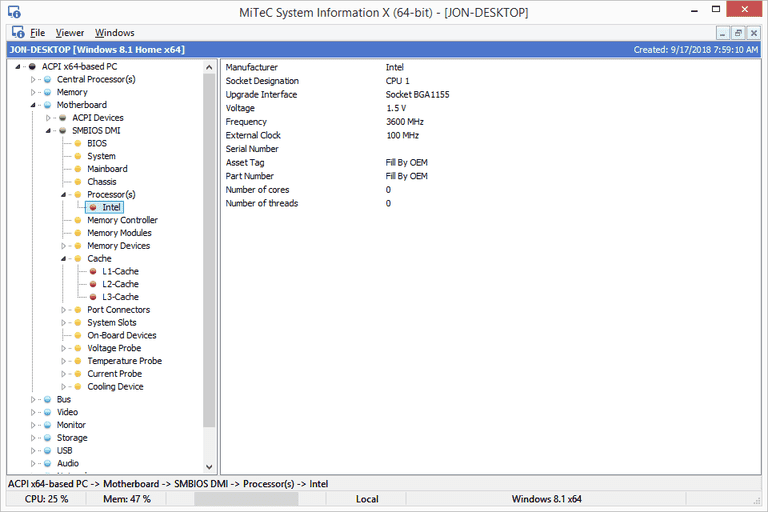 This review is of MiTeC System Information X version 3.3.0.0, which was released on March 28, 2019. Please let me know if there's a newer version I need to review. MiTeC System Information X finds information on the CPU, memory, motherboard, operating system, video card, monitor, storage devices, network card, printers, and USB ports. Windows 10, Windows 8, Windows 7, Windows Vista, Windows XP, and Windows 2000 are supported. MiTeC System Information X also works with Windows Server 2008 and 2003. See the What MiTeC System Information X​ Identifies section at the bottom of this review for all the details on the hardware and operating system information you can expect to learn about your computer using MiTeC System Information X. There's much to like about MiTeC System Information X.
I like how easy MiTeC System Information X is to use. It's simple to find what you're looking for and the details are just specific enough without being overwhelming. I say above that you can copy data out of MiTeC System Information X without having to export anything as a whole. Right-clicking won't work, but you can double-click the information to copy it. However, instead of copying individual information out to the clipboard, you are able to save a list of all the installed applications to a CSV file, which could be useful. MiTeC System Information X is beneficial for both regular and advanced users, mainly because it's not confusing to use but still provides an adequate amount of hardware and software detail. See Am I Running a 32-bit or 64-bit Version of Windows? to know which download link to choose for MiTeC System Information X. To launch the program, choose MSIX or MSIX64 from the extracted ZIP file.